Two years after the Canucks traded Cody Hodgson to the Buffalo Sabres in exchange for Zack Kassian , the comparisons remain. Who won the trade? 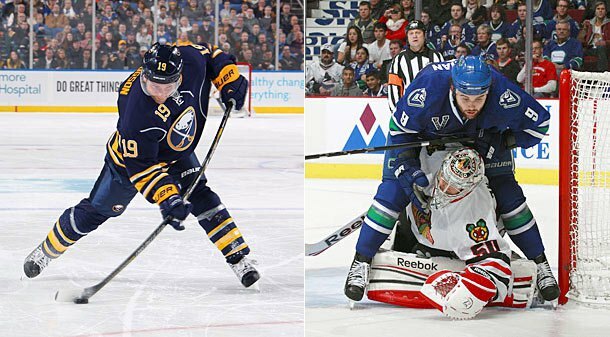 It’s been two years since the Vancouver Canucks traded formerly golden boy, Cody Hodgson, to the Buffalo Sabres for Zack Kassian. And ever since then, we’ve been trying to establish whether or not the trade was a good trade or bad trade. There have been a ton of articles written about the two and how, statistically, they’ve performed for their new teams. But personally, both are different players – they have different strengths and faults – and I’m not sure how you compare the two. Hodgson is a 6’0″ smart, playmaking centre; Kassian is a 6’3″ power forward in the making. Right now, Hodgson is expected to make plays and score on the last place Sabres’ top-six, if not on its top line. With 16 goals and 20 assists this season, averaging 19 minutes of ice-time per game, he’s done that for the most part. However, his -24 rating and soft play without the puck leaves a lot to be desired. On the other hand, the Canucks’ expectations of Kassian for now are a bit different. Of course they hope he can eventually put up top-six numbers (he has 11 goals and 19 points – both career-bests – so far this season), but, playing on the bottom-six for about 14 minutes a game, GM Mike Gillis and coach John Tortorella first and foremost want him to learn to play more responsibly at both ends of the ice and take the body and provide a physical presence more consistently. As it stands, analyzing Hodgson’s and Kassian’s points is, excuse the pun, pointless. Hodgson has better numbers, but he’s also been placed in a more offensive role than Kass. Does this mean that the Sabres won the trade? For now, the jury is out. In my opinion, it’s too early to tell which team won the trade. Both Hodgson and Kassian seem to address their respective teams’ needs: the Sabres’ need for a scorer and the Canucks’ need for size. At the time, the trade perhaps made sense for both teams, and at least for now, both players are providing what’s been expected of them. Kassian scored a goal, but Cody’s Sabres beat the Canucks 5-3 in their last visit to Rogers Arena shortly after the 2012 NHL trade deadline. Canucks fans don’t like divas, and in his short time here, Hodgson certainly came across as one. Even the vets gave him a hard time about it – remember Luongo playfully advocating for more ice-time and the players taping a “C” on his jersey just a few hours before he was traded. As always, it should be interesting to see the kind of reception he gets from the hometown faithful. The Canucks get Daniel Sedin back from injury. Unfortunately, they’ve lost Alex Burrows again. Too bad too. Burrows had 5 goals in his last 5 games, including a couple of 2-goal games. Henrik Sedin played his 1,000th NHL game last week. The Canucks will celebrate his milestone tonight. Previous story Game Day Preview: Nothing to Lose versus Panicked and Desperate.